J&D Floor Covering & Millwork in Lockport, NY also has the experience and technology available to dream up your most beautiful staircase. Each unique project is built with an unmatched level of quality and attention to detail. If you have high traffic areas where kids and pets are constantly treading, you need a flooring option that is both durable and easy to clean. 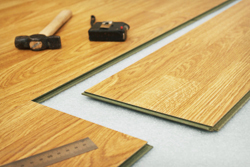 There are many flooring options available, but laminate flooring is a great option for high-traffic flooring that is both durable and affordable. Call us today for more information or for a free estimate. Our friendly staff members will be more than happy to assist you with any questions and concerns.